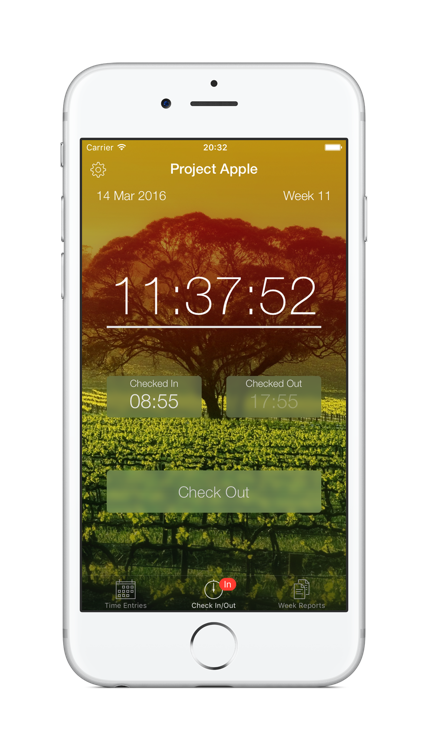 Week Timer has been developed with your user experience in mind. Ideally you don’t want to do any timesheet management or week reporting, but your employer demands it. 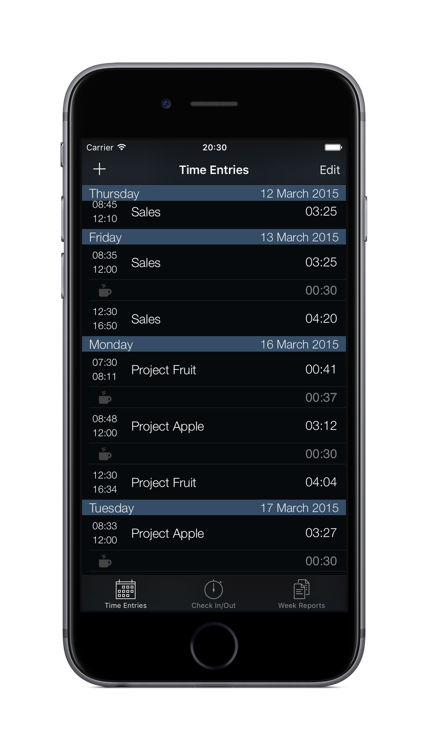 Week Timer aims to be as streamlined as possible so you can log your working times effortlessly and complete your timesheet in an accurate manner. 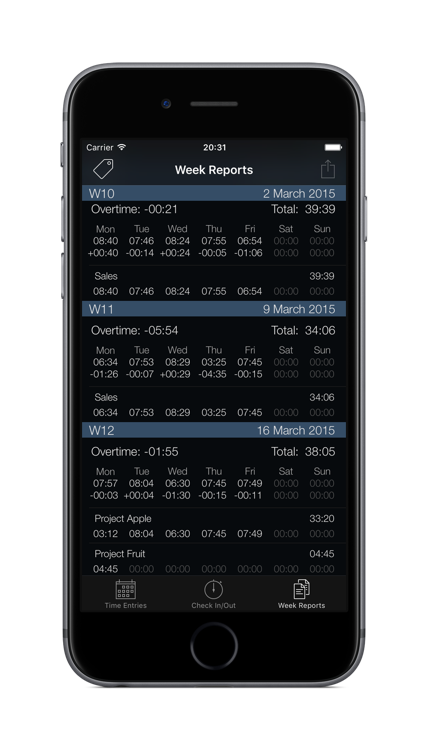 At the same time you can also track your overtime on a daily and weekly basis. Just tap the timer to toggle between the different views! Week Timer is designed to track a single work period a day – check in in the morning, check out in the afternoon, just like you would with a classic punch clock. Your target check out time is indicated in the check out field. This is the easiest way to track time if you only have a lunch break that you want to deduct. The lunchtime is deducted automatically according to your settings. On the other hand, you may check in and check out several times a day, which is also supported. Note that the lunch time will only be deducted from a time period if it is fully included within that period. If you check out in the middle of a lunch period, Week Timer will assume you have checked out manually for lunch and not deduct any additional time. Set your Target Times that you are expected to work each day of your work week. Your daily and weekly overtime will be based on these target values. The sum of the target hours is displayed at the end of the section for your convenience. Enable Auto Lunchtime if you want to deduct your standard lunchtime. The duration of your lunch will be deducted from your worked hours when your work period overlaps the lunch time. No need to check out and back in again for lunchtime! Setup your Default Email to send your reports to so you don’t need to enter an email address every time you send your week report. Enable or disable Week Numbers according to your preference. When enabled, week numbers are displayed on the main screen, and take a more central position in the week reports. US and European week number system supported (ISO 8601). If you would like to know more about week numbers please take a look at: Week Numbers. Set the First Day of Week if you would like to override the default first day which is based on your current locale. Specify the Duration/Overtime format that you prefer. There is a choice of “hh:mm”, “hh.dd” or “hh,dd”. This will be used for both the report view in the app aswell as in the emailed reports. 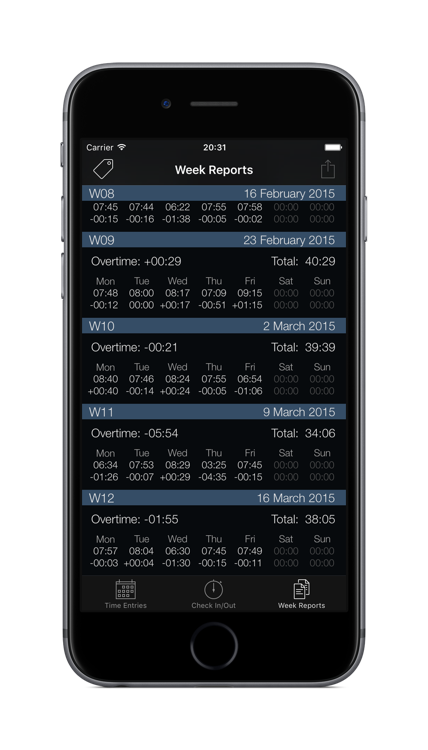 Show Overtime will show the details of your overtime for each day of the week. Predictive overtime is always active for the current week, which indicates how many hours you still need to work the remainder of the week to reach your target or more importantly to achieve a good work-life balance. The additional setting for Track Inactive Days is merely there for legacy purposes. If you always register a time entry on each day, even when you skip a day due to e.g. holiday or illness, then this is probably the setting you want. If you would like to be reminded to check out just before or after you have completed the target hours for the day, set the Checkout Reminder. If you prefer to be more discrete and not post a notification on the screen stating your overtime, you can replace it with your own custom message. Note that this custom message is identical each time it is repeated, whereas the default message includes overtime and/or checkout time. Select one or more weeks by simply tapping on them. Tap on the action button and select Email in the menu. The week reports will be included both as text in the email body and as a CSV attachment. When at your desktop at work, either copy and paste the data from your email to your time sheet or week report, or open the CSV attachment in a spreadsheet program e.g. Excel if that is a more suitable workflow. If you work part time or are on partial parental leave, you can still track your overtime like the example below illustrates for Tuesday. Tags can be used to track tasks in more detail. A time entry can be assigned a tag, which will be used for summarizing all time entries with that tag type. The week report will display all the tags used for that week, and sum up the hours for each tag. For example, if the number of hours that were spent on meetings needs to be reported, then each time entry can be tagged with a “meeting” tag, so the sum of all meetings is reported in the week report. But it gets simpler than that…. Of course, assigning tags afterwards is not efficient when you are working. At any time of the day, a new time entry can be created with a new tag, just by tapping the title bar. 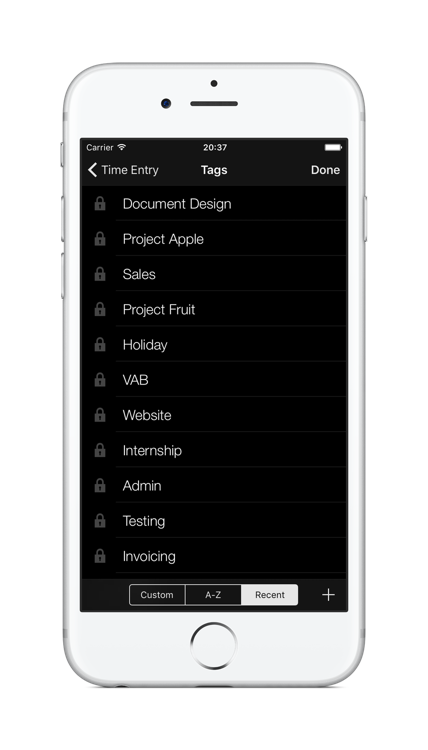 The tag list will be displayed and an appropriate tag can be selected and a new time entry is created with that tag. Note that when you check in in the morning, the time entry will be assigned the most recently used tag of the last time entry. While checked in the tag can not only be switched, but also changed for the current time entry, if the wrong tag was selected by mistake. This can be changed either in the Time Entries view, or by using a long press on the title bar. When Tags have been used the Week Report will always include these tags and the sum of the hours for that tag for that week. In Week Timer V2 both time entries and breaks can be edited. To edit a break or an entry simply select them and change the values. To delete a time entry, either swipe to the right over the entry, or tap the edit button and select delete. When a break is deleted, the end time of the time entry preceeding the break is adjusted. When a break is deleted, and the tags are identical before and after the break (or no tags selected), the time entries will be merged aswell as the notes. To add a new time entry either tap the plus button, or long press on a time entry after which you would like to add a new entry.To split a time entry (add a break), long press on a time entry, and select the time entry you would like to split. 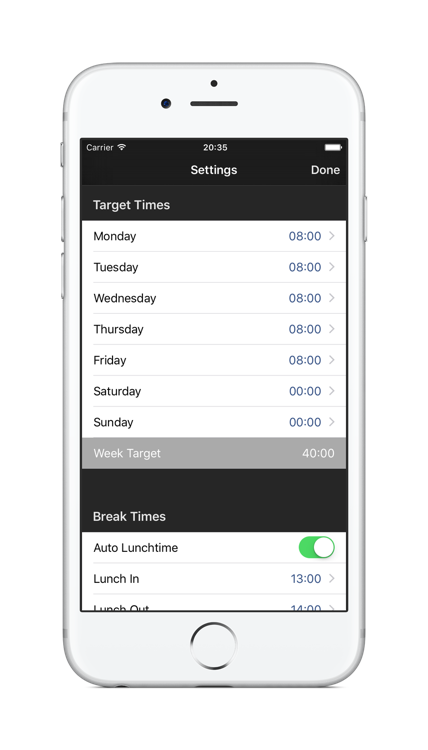 To toggle auto-lunch in a new or existing time entry, just tap the break duration below the time entry duration. It will be set to 00:00 and the break will be removed. Tap it again and the break is added. Auto-lunch must be enabled in the settings for this to work. To change the minute accuracy of the time editor, tap the wheel icon on the bottom right of the screen. 3, 5 or 15 minutes can be selected. In the settings menu below Backup it is possible to create backups of the current timeentries in the database. 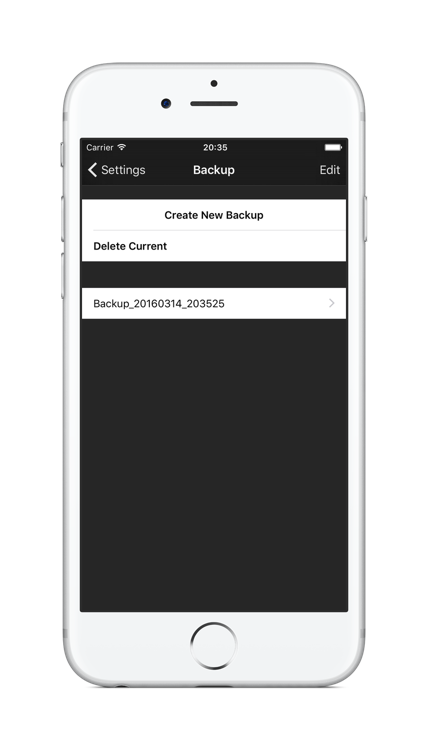 WhenCreate New Backup is selected, the backup will be generated and displayed with a generated name below. By tapping on the backup, a view appears with the name and the options to email or restore the backup. The backup name can be edited by tapping on it. Tapping the Email button will will launch the email dialog and attach the backup file. Send this to an appropriate receiver, which could be your own email, or a cloud drive like dropbox. Restoring can be done when moving to a new device or after reinstalling your device without restoring a full backup from iTunes or iCloud. Other reasons hopefully never occur, to require a restore. To restore a backup make sure it is available on your iDevice in for example in your mailbox or a cloud drive. Tap to open the backup file with the extension “.wtb”. This should display a menu which includes Week Timer. Tap Week Timer and the backup will be saved in the backup list in the app. Now navigate to the backup menu in settings in Week Timer, where you will see the new backup that was added. Tap the backup and select the menu option restore. This option will make an automatic backup of the current database and then restore the selected backup. Once restored, you are good to go. You may notice that the automatic backup has been added to your backup list. If anything failed with the restored backup the automatic backup can always be used. Although all the time entries are backed up and restored, the settings are not. Be sure to set the settings appropriately when restoring to a new device. To customise your main view with a more pleasant background enable Photo Theme. On the photo theme settings page two options are available. Either choose one of the included backgrounds , or select a photo from the photo albums. 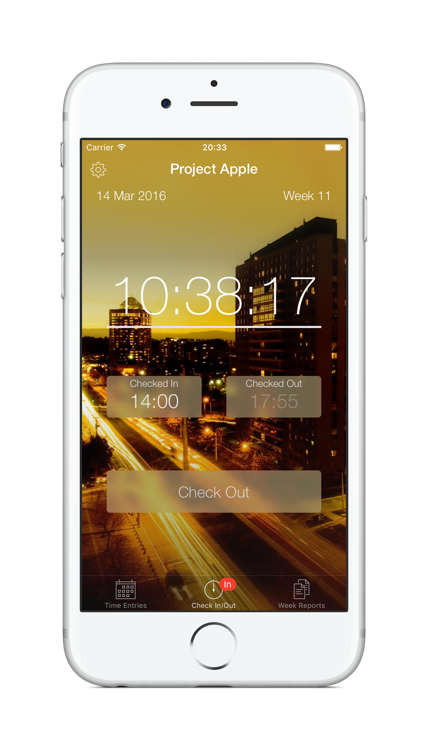 Week Timer tracks overtime on a weekly basis and is reset at the end of the working week. Overtime can be disabled in the settings if you are not interested in tracking this because you may not have a fixed contract or fixed work hours. If you do have fixed work hours each week, then you can benefit from the predicted overtime feature in the Week Reports view. This will show how much extra time you still have left to work on the remaining days of the week. If you have already worked extra hours at the beginning of the week, a negative overtime will be displayed on the remaining days. While still checked in, the predicted overtime will also include the current day, until you have reached this expected overtime. After that the predicted overtime for the remaining days will be adjusted, so you can see your required overtime shrink for the remainder of the week.